This question is because of some close votes due to EOL are wrong - I expect it is quite a lot. EOL (Off topic): 10.04 Desktop, 11.04 and 11.10, 12.10, 13.04 and 13.10. Not EOL (On topic): 10.04 Server, 12.04, 14.04. Or maybe, rather than a tooltip, just a message. That would be better than it nagging. It could maybe only appear depending on keywords? New releases need to be added. I know it's not a daily task but that also means this tooltip is going to grow. It won't be long before it's longer than the actual close text. We need to work out what's actually on-topic. Even after we get onto a standard Ubuntu LTS, some spins have shorter LTS periods but how does that affect the base support level? Who knows?! Codifying things so strictly seems to scare all common sense away and you're left with people doing stupid things in the name of "the law"... And that can involve a thousand meta battles to fully unwind. Ultimately you shouldn't be voting to close as something unless you're sure that applies. A hundred tooltips aren't going to every person getting that wrong. That's why it usually takes more than one person to get something closed. There's a link right in the text that should explain what is and isn't on-topic. It's very Ubuntu-centric so might not be the best link. If there's a better option we should change the close message to point to that link. The question was correctly closed - because LTSP on 10.04 LTS is no longer supported. To clarify exactly what is still "supported" on 10.04 LTS, the Security Team FAQ says: "For Ubuntu 10.04 LTS, the list of 5y supported packages is here." That list of supported packages is limited to only 613 supported packages. Every other package from 10.04 is now unsupported. ltsp-server and ltsp-client are unsupported packages. 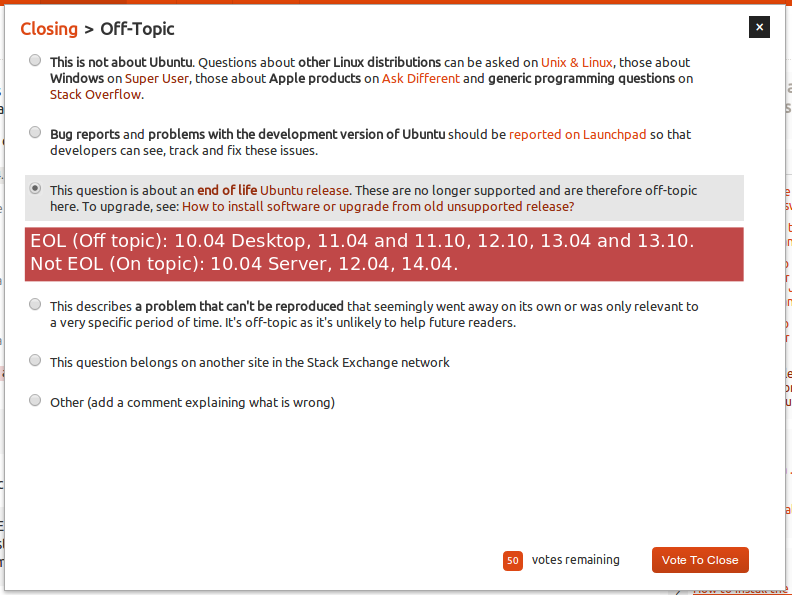 This implies that the question was being correctly closed, as the question was regarding unsupported packages. Unsupported packages do not get security updates, and we should not be encouraging people to use them. What if there is a remote exploit in the 10.04 ltsp-server? It will not have been fixed, and will never be fixed in the future, and for that reason users need to be made aware that their software is no longer supported and should not be used. Even without knowledge of the supported package list, it should have been obvious that the 10.04 ltsp-client is a desktop system - the package directly depends on xorg - and as such it is no longer supported. Not the answer you're looking for? Browse other questions tagged discussion feature-request scope end-of-life .